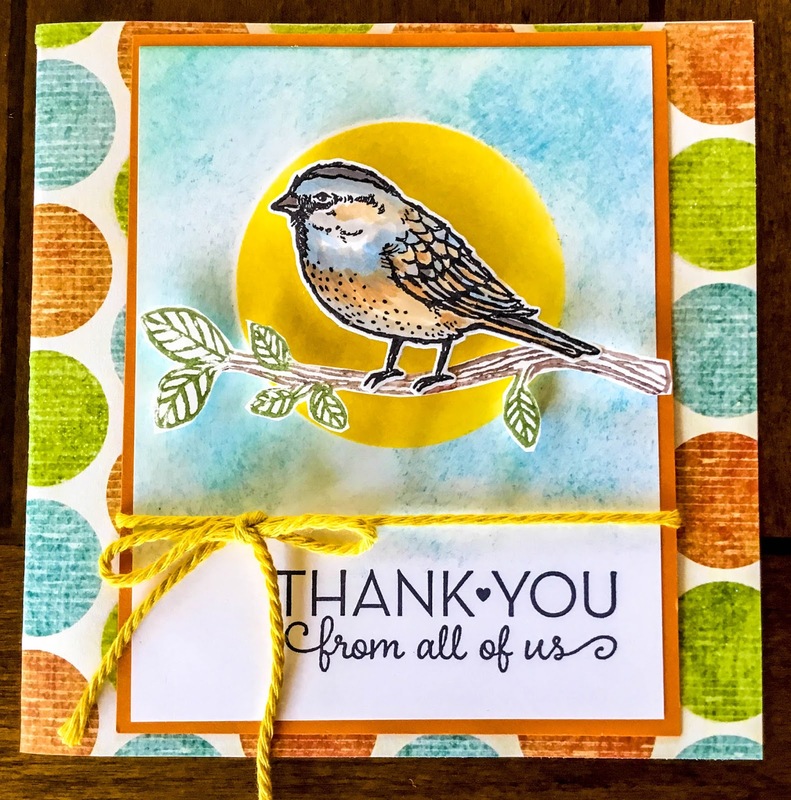 Thank you for joining me as I delve into the paper arts and experiment with techniques and conjure up handmade cards, altered art pieces, and other crafty items. Here you can find samples of my work and tutorials for projects and cards. Feel free to leave comments and links back to your stamping sites. When the latest Stampin' Up catalog arrived in my lap, I did my usually salivating on every page, followed by lots of "oooohs" and "ahhhhhs". I am totally besotted with bird watching. Much to the dismay of my husband, I have several feeders going at the house. (He's not too keen with our battle to keep the acrobatic squirrels off the feeders.) When I saw the SU Best Birds stamp set with the Birds & Blooms Sizzix Thinlits, I was "flying" at the chance to order these items. 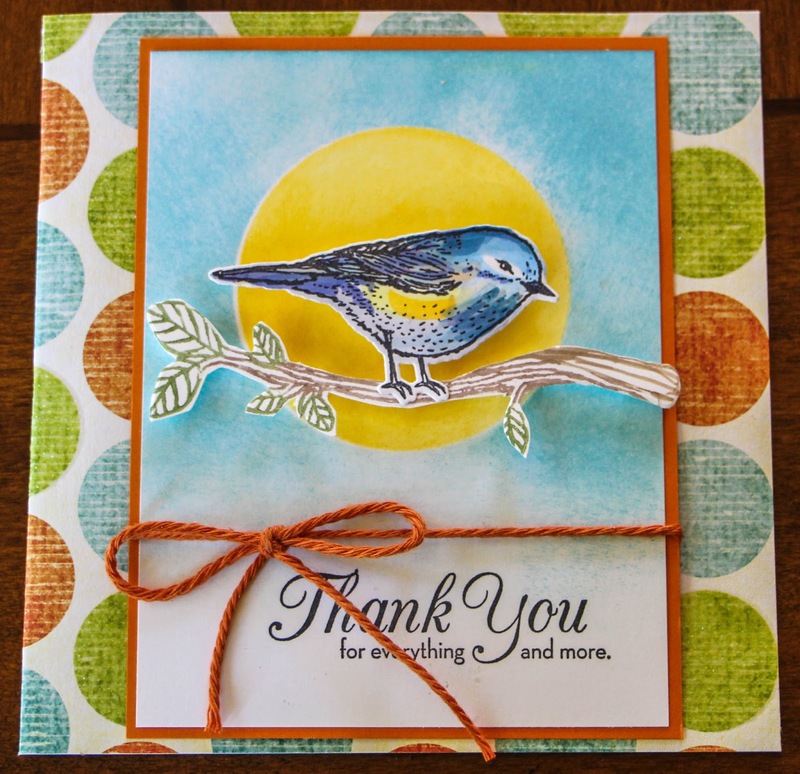 After this bundle arrived, I went onto www.splitcoaststampers.com and found a card I really liked by Deb Mauch. I used some Michelle Zindorf sponging tutorials to make the sun and sky. Very easy to do and incredibly rewarding results. I used photos of male and female Yellow-Rumped Warblers as samples for coloring the stamped bird images. Not sure if I succeeded, but there you go! The branch and birds were cut out using the coordinating Thinlits. 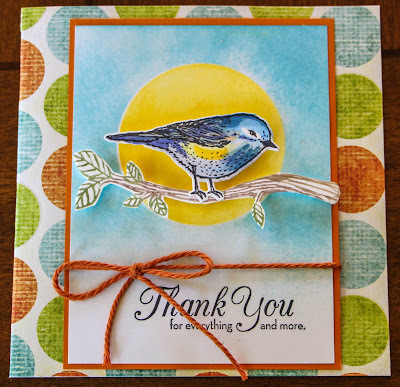 In addition to using the SU Best Birds stamp set, I used SU One Big Meaning for the 'thank you' sentiment. The card was made for our veterinarian's kennel manager, Lisa. She went above and beyond to give our 14-year-old dog, Sophie, lots of tender loving care in the kennels while we were in England attending our son's university graduation. We rubber stampers and paper crafters are always inspired by one another and our artwork. I hope you find such inspiration and ideas here. At the same time, please be thoughtful and kind and do not lift my ideas and designs for publication submissions or design contests. All content on my site is the personal property of Kathryn McAllister; please do not use or publish photos of my artwork without my written permission.